could harm their air or water quality. 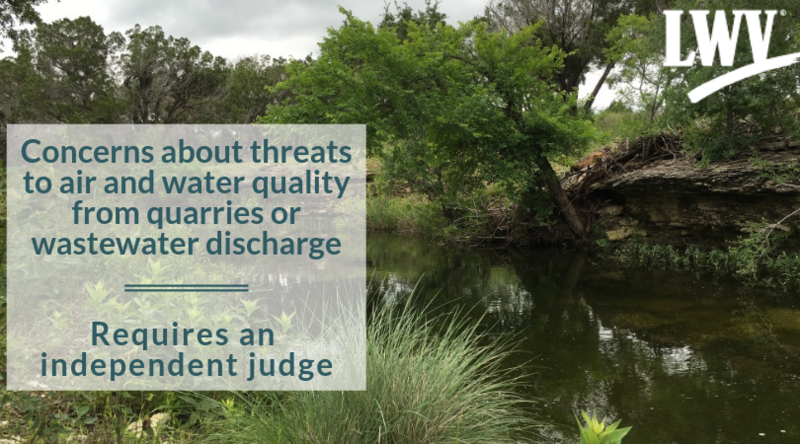 Residents with concerns about threats to air and water quality from quarries or wastewater discharge often dispute permits being approved by TCEQ. Residents use the contested-case hearing to express those concerns to overturn the TCEQ decision. Currently, TCEQ must use the State Office of Administrative Hearings (SOAH), which is an independent body, to hold contested case hearings. HB 3114 would allow TCEQ to substitute their own in-house administrative law judge, thereby removing an independent judge from the process. The contested case hearing is the last line of defense for citizens trying to protect air and water quality in their community. The hearing needs to be an independent and fair process. If you have had experience with a contested case hearing, please edit the message to your legislator with your personal story about the importance of an impartial judge.